316 pages | 22 Color Illus. | 101 B/W Illus. Superconductors (SCs) are attractive materials in all respects for any community. They provide a deep insight into the physical properties of the condensed matters and also have useful applications as ultra-low-power-dissipation systems that can help resolve the present energy problems. 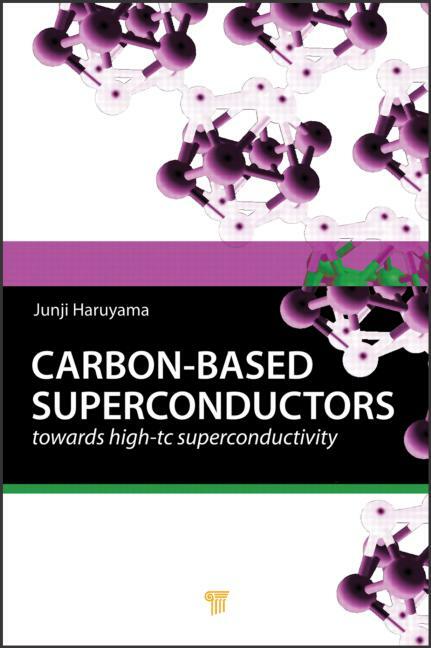 In particular, the recent advancement of carbon-based new superconductors (CNSCs) is significant. Before 2004, the superconducting transition temperature (Tc) of carbon-based SCs was below 1 K, except in fullerene clusters. However, in 2004, a Russian group discovered that diamond highly doped with boron could be an SC at Tc = 4 K. The following year, a group from Cambridge found that calcium-intercalated graphite could be an SC with Tc = 11.5 K. In 2006 and 2008, the editor’s group from Japan also discovered that carbon nanotubes could be SCs at Tc = 12 K. Since then, research on CNSCs has increased notably. Junji Haruyama is professor of materials science at the Faculty of Science and Technology, Aoyama Gakuin University, Japan. He graduated from Waseda University, Tokyo, Japan, in 1985, after which he joined NEC Corporation, Japan. He received his PhD in physics from Waseda University in 1996. During 1995–1997, he worked with the University of Toronto, Canada, and Ontario Laser and Lightwave Research Center, Canada, as a visiting scientist. Then he was a visiting professor at NTT Basic Research Laboratories, Japan, and the Institute for Solid State Physics, the University of Tokyo, Japan. Currently, he is also a principal researcher for a grant by the Air Force Office of Scientific Research, USA, for a project on carbon-based high-Tc superconductivity. Prof. Haruyama has discovered the world’s highest Tc and one-dimensional superconductivity in two different types of carbon nanotubes (CNTs); large energy bandgaps in CNT-derived graphene nanoribbons; spontaneous spin polarization at graphene edges (flat-band ferromagnetism) and its application to rare-metal-free TMR device; and spin-orbit-interaction induced spin coherence in hydrogenated graphene. He has authored over 30 books and over 100 peer-reviewed articles in international journals, including Physical Review Letters and Nature Nanotechnology. He has been honored with many grants by the Japan Science and Technology agency, the Japan Society for the Promotion of Science, and the Ministry of Education, Culture, Sports, Science and Technology of Japan. His main research interest is the study of quantum phenomena (e.g., low-dimensional electron correlation, spintronics, superconductivity, single electron tunneling, and quantum [information] devices) in nanomaterials such as graphene (mono-atomic layer materials), CNTs, nanowires, and compound semiconductors, and their applications to novel quantum devices.